I know I'm pathetic for saying this but I'm watching the new AAF football league. It's actually pretty good. Not XFLish, just alot of guys on the edge of the NFL I suppose. Minor league baseball. AAA teams' health is directly related to the health of MLB. The same here. If the NFL is sick, then no one cares about the kiddies in the back yard. Any idea what, if anything the NFL has to do with this league? I noticed that the Sunday night game is on the NFL network. 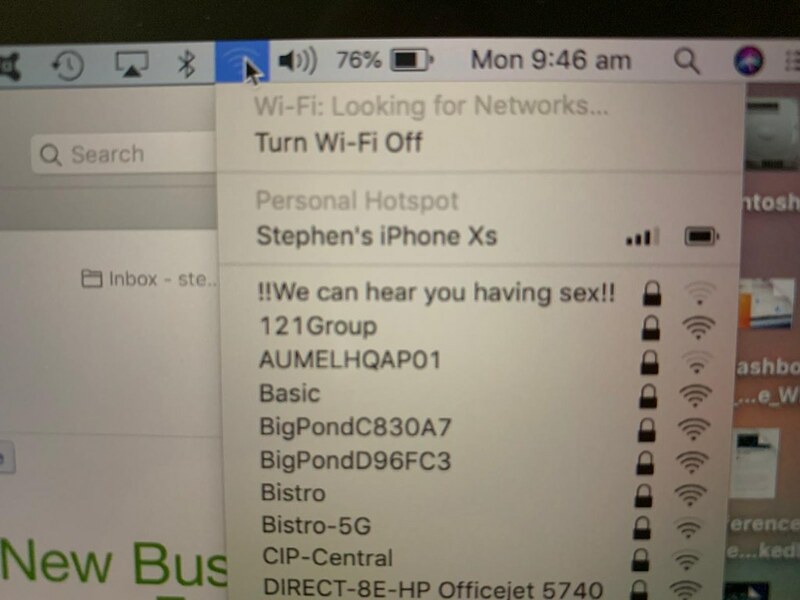 A friend of mine, Steve, was connecting his laptop to a wireless network somewhere in the city today. When he looked for available networks, this is what he saw. Ok. Yes, it’s childish. But I still chuckled. Ha! I've seen some entertaining network ID's, but I really like that one. Thanks, it is easy to follow a winner! Speaking of wrestling and winners... Gable Steveson. I'm more impressed each time I watch him wrestle. He's unreal. And he's only 18 years old. This kid's parents were prescient, naming their son after Dan Gable. Australia doesn’t get a lot of ground strike lightening. Heaps of sheet lightening but not many ground strikes. So people tend to be pretty lightening naive. I can’t think of a time I heard about an Australian being struck by lightening. So these scenes from a women’s footy game (the women’s national league is currently in season) are astounding. I can’t believe 20 people weren’t killed by that last strike. And I can’t belive everyone is just sitting around rather than getting under proper cover. Probably better to sit around in a low spot than get under a partially enclosed shelter or tree that the lightning might be attracted to. Congrats on finishing. An often unachieved accomplishment. What are you doing next? I'm making a move from pharma to med device. I accepted the current job after being laid off last winter, and while I was happy to find work, I have been less than satisfied with my position and with the department/company. Add in some corporate turmoil, and I think the future of this site is in jeopardy. A former coworker called me last month, and the timing and job opportunity work out very well for me. Also, pharma careers in MN are scarce (and getting scarcer), and the MN med device scene is booming, making me more marketable in the future. Good to hear, duffman. Old folks bones, I say. That’s where the med money is. Lots of creaky bones now days with the aging baby boomers. Duffman, I sent you a PM but I keep getting error messages when I try to look at my sent mailbox. Can you let me know if you got it? When you say old folks bones, did you have anybody in particular In mind? Like maybe an old Mount Union alum, currently living in Alliance, posts as "MUC57"? Maybe it was "57Johnnie"! I mean, we are the seniors on the boards. Ah well, we can take it. G'day mate. May your boomerang return. You're one of the posts I always read. Best to ya with your med devices. Not sure how inclusive that is but good luck anyway. Of course, I've been retired for quite a few years but I recall some similar situations in my career. Go get 'em! Hope you're having a better day than me. When I woke up this morning, I "forgot the Alamo". The day went downhill from there! Go Everybody! MUC57 - Don't forget the Alamo. Pee Wee Herman's bicycle is in the basement!